Kendell and Pauline are ready for a relaxing Hawaiian vacation. When a local surfer, and girlfriend of a friend, is found dead, they realize there is no escaping another murder mystery. Can the gals solve the mystery that has turned the white sands of Hawaii red? It all started when Kendell met Pauline (and her purse dog Dot) on a flight to London, England. They became fast friends. Pauline is an elderly widow looking for a traveling companion and Kendell desperately needs a vacation from her job as a flight attendant. Pauline makes Kendell an offer she can’t refuse - an all expense paid trip all over the world. They’ve already been to London and Kenya. Their next adventure is Hawaii. A place Pauline’s husband always wanted to go, but never had the chance. Much to Kendell’s surprise she runs into her best friend Brandon. He’s in Hawaii to cheer on his brother and his brother’s girlfriend in a surfing competition. There was a mistake in the hotel reservations and Pauline offers Brandon a chance to stay with them. Brandon’s brother gives them all a chance to soak up some of the local beaches that tourists don’t always get the chance to see. Things don’t go as planned when the girlfriend is murdered. Pauline and Kendell are quickly on the case. There were murders on their previous trips as well and they’ve always managed to solve the murder. They see no reason for this time to be any different. 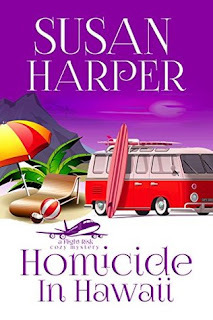 This is the third book in the Flight Risk Cozy Mystery series. It takes a bit to get over the continued generosity of Pauline fully financing Kendell’s trip (which sometimes includes her friends). After all, the women haven’t known each other very long. Kendell doesn’t even pay for meals. LOL However, it’s a couple of hours of pure fun and enjoyment to read. These books make me feel good. Pauline and Kendell make me smile. They take some crazy risks to solve mysteries, but they are amateur sleuths and that’s their job :) I’m always wondering what craziness they will find themselves in next. Their next trip is Peru. It should be fun. Disclosure: I borrowed this through Kindle Unlimited. I was not required to write a positive review. All opinions expressed are my own. I always think the books you review sound really good, and they all have covers I love! Terrific review! This Flight Risk Cozy Mystery series sounds like a lot of fun. Sounds like a great book! I love this cover too.